For the past month (at least) I've had granola nearly every morning for breakfast. That's not an exaggeration - the only times I've had a different breakfast was because all existing granola had already been consumed. To be clear - I've never been much of a fan of store bought granola; I enjoy customizing my food too much, and also, why is granola so expensive? I buy my oats, dried fruit, nuts, and seeds from the bulk section in the grocery store, and it comes in at well under $10. This recipe is not only fairly cheap, it's fast to mix and easy to make. It's not overwhelmingly sweet, but a simple addition of honey while baking can satisfy those with more of a sweet tooth. It's delightfully crunchy, and you can choose your own blend of dried fruits, nuts, seeds, so the granola is everything you want to see in your breakfast (or snack). What's not to love? * Other invert sugars can be substituted for corn syrup, such as honey or maple syrup. However, corn syrup is the cheapest option and will give you best "shine" on your granola; maple syrup granola will taste lovely, but due to a higher water content the granola will appear more matte than glossy. ** The vanilla is totally optional, and you can easily substitute or add in other spices such as cinnamon, clove, allspice, nutmeg, cardamom, etc. (You could also combine all of the above for a Chai spice type flavouring). *** I took these measurements using whole almonds, pumpkin seeds, and dried cherries. If you've picked different ingredients and aren't using a scale, the quantities may differ slightly (particularly if you're using a smaller seed like sunflower, or pre-chopped nuts). No matter your ingredients, the metric measurements will not change. 1. PREHEAT your oven to 300 degrees (f). 2. 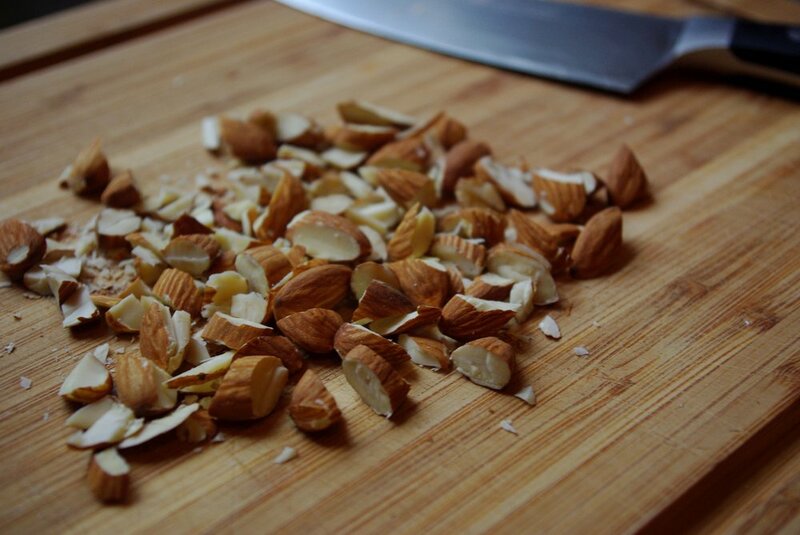 CHOP your nuts into whatever size you prefer, or if you like, leave them whole. I'd advise against chopping them any smaller than your oats, to prevent the nuts browning too quickly. 3. COMBINE your oats, chopped nuts, and seeds in a large mixing bowl. Do not include your dried fruit - this will be added after baking to prevent burning and hardening in the oven. 4. STIR together your corn syrup, vegetable oil, salt, sugar, and vanilla in a small pot. Set the pot over medium heat, stirring occasionally, until the mixture boils. Let the mixture boil for about 30 seconds, stirring once or twice to dissolve the sugar, but do not let the boiling exceed a minute. Boiling this mixture for too long will create too much heat, turning it into candy that won't coat your oat mixture evenly. If you see the edges of the mixture start to turn brown (caramelize) it's boiled too long and you must start over. 5. POUR the boiled syrup into your bowl of oats, scraping out the pot with a heat-proof spatula. Stir and fold the mixture until the oats, nuts, and seeds are coated evenly with syrup. 6. LINE a baking sheet with parchment and give it a generous coat of non-stick spray. The parchment isn't necessary (you could also use foil) but it will make your life a lot easier; do not skip the non-stick spray. If you don't have any, pour some vegetable oil on your pan and give it a thin but even coating. 7. SPREAD the oat mixture on the baking tray, filling it all the way to the edges. For optimal cooking, make the layer of oats as even in thickness as possible. Remember that the thicker your layer of oats, the longer this will take to bake, so use the biggest tray possible. 8. 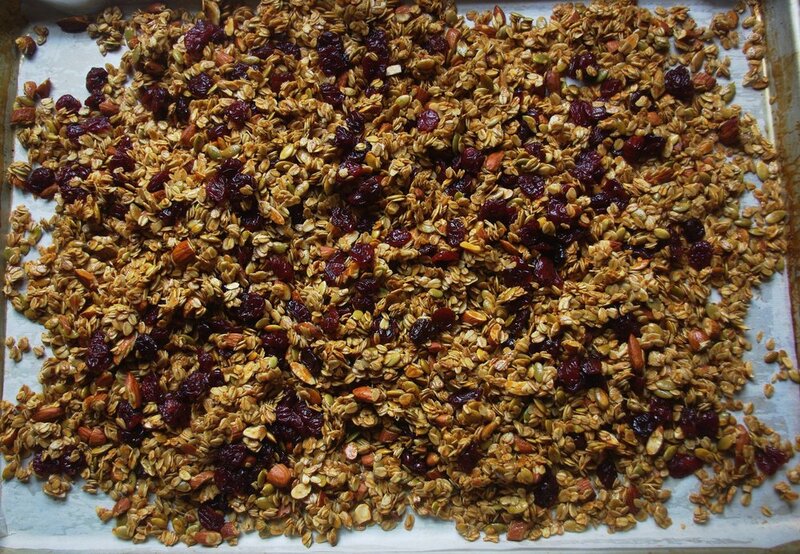 BAKE the granola mixture for 20 minutes, then remove from the oven. Give it all a good stir (I create a little mountain of oats in the center of my tray by scraping all the edges in to the middle) and spread it back out again, creating an even layer. Return to the oven for 20 more minutes, and repeat. You should start to see some browning by this point - use your discretion to determine how dark you want to take your granola, but I aim for an even golden-brown. For my desired colour, I baked my granola for 10 minutes more (a total of 50 minutes). If you have a smaller pan and a thicker layer of oats, you will need longer than 50 minutes, so keep checking and stirring the mixture every 20 minutes until you achieve the colour you want. 9. REMOVE your granola from the oven, and while still warm, add your dried fruit. How you let this cool will affect the final product - allowing it to sit without any agitation will give you larger "chunks" of granola, while occasional stirring creates a more cereal-like mixture. If you want larger pieces, mix in your fruit immediately after the granola comes out of the oven, pat it down with a spatula to create an even layer, and allow to cool completely before breaking apart with your hands. 10. COOL the granola completely before packaging it. This granola can be stored in an air tight container at room temperature for a week, or up to a week and a half (I think - I can't say for sure because mine never lasts this long). 11. ENJOY as you see fit. Take it hiking or to work for a snack, eat it with yogurt and fruit (my favourite preparation), replace your cereal with it. Follow your heart (or stomach). Your granola, your choice.